Anyone that's ever been stranded on the side of the road, with their car DOA knows the value of a dependable and long-lasting battery charger. It's common to go through several before finding one that lasts and is successful in getting your battery to hold a charge. The Schumacher SC-1200A-CA does just that. I can't tell you how impressed I was with the first use, and then the 6th just the other day! It still works just as well as it did the first time when I awoke on a chilly morning to find my truck not turning over. I called work to let them know I was running late, then pulled out the charger to give it a go for the first time. It was a replacement to my old charger which disappointed me one too many times before I had to throw it out. I'd heard that Schumacher was a choice brand after getting several recommendations from my car-smart buddies. Thankfully the truck battery wasn't completely drained so I hooked up the charger and went back inside for a hot cup of coffee. When I came back out just 15 minutes later, the battery was already at 20% from 10%, and the batter was cycling at about 16 volts. The charger is very lightweight making it easy to move around, but backs a punch. It only took 2 hours before my battery was fully charged. Other models I've used have taken a minimum of 4 hours. In fact, This Schumacher brand turned over like a brand new battery. I'm so happy for the recommendations. Some other things that impressed me about the charger are the 5-year warranty, the constant charge monitoring, and the desulfation mode which you are notified of if your battery needs it. That eliminates a headache or two. Even if you think your battery may be too sulfated to charge, this brand will do the trick. I decided to try an old battery I'd had sitting in my garage for who knows what reason. I actually got it charged to 50% before stopping the process. In other instances it quickly charges all the way to 100%. 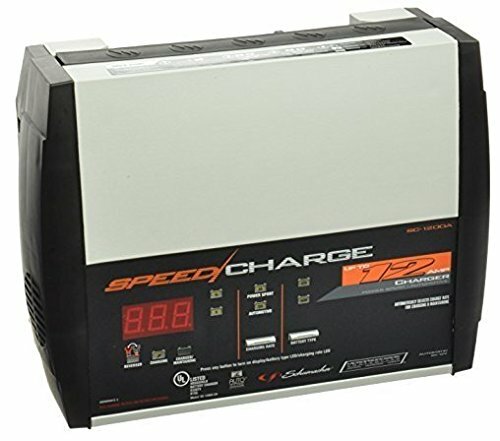 I have a wide variety of vehicles and I'd guess the batteries will be in good hands with this charger for much longer than any other brand. My friend said he had the charger for a couple years and it was having some display glitches. Schumacher promptly replaced it with zero hassle. When a company backs their product that well, you know you've made a smart investment. If you have a vehicle that doesn't get driven much, this is the charger to keep on call so when the need arises, you can get it up and running quickly. Either way it's a great addition for your car maintenance needs.